Gathering of Peace Patriots at the base of the Soldiers & Sailors Monument in New London, CT Broad & State Streets. Elliott Adams, National President of Veterans for Peace, descendant of 2 US Presidents, and g.g.g.grand cousin to Samuel Adams! Carlos & Melida Arredondo, Gold Star Families. Parents of Cpl. 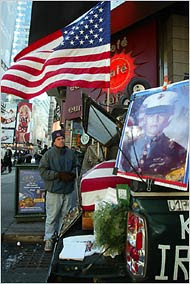 Alex Arredondo USMC, Killed in Najaf, Iraq. Carlos & Melida Arredondo are members of Gold Star Families, and members of Military Families Speak Out and will be here for the overnight vigil honor guard at Camp Alex Arredondo's memorial casket and medals, photographs, & boots. Come to what has been hidden from the press by executive orders. Pay you person respects to all of the fallen. Ted Goodnight, VFP and IVAW, Veteran of US Army in Afghanistan and North Carolina Army National Guard deployed to Mississippi during Hurricane Katrina. John Bangert, UU, VFP, MFSO, Cape Codders for Peace and Justice, Cape Cod Peace Community. Twin brother to Joe Bangert for Winter Soldier Films, Sir, No Sir acclaim. 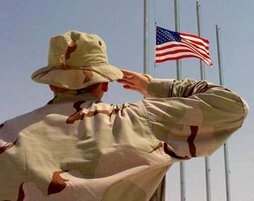 Presently has a nephew in serving in Afghanistan, an another nephew who served in the Gulf War of 1991. UU, Friends, VFP and Code Pink members have been invited to stay overnight in Unity Hall and may set up their sleeping bags there once the choir leaves @ 9:00pm. No need preaching to the choir:) ! Early Breakfast will we served before the rally and protest at USGC Academy. If you would be kind enough to e-mail and RSVP so we know roughly how many folks will be here on Tuesday night. Hosting Community of Faith we thank you for your mercy and sense of justice for all! 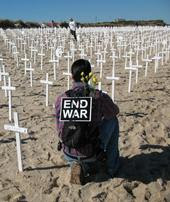 New England Regional Anti-War Protest! 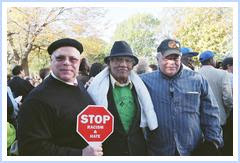 We also want to acknowledge the constant works of St. Francis House, in New London, CT and we salute Cal Robertson VFP member for his 20 + years commitment to his PEACE VIGIL at the Soldiers & Sailors Memorial in New London, CT. VFP President Elliott Adams will be meeting at St. Francis House Community this weekend as well. Carlos Arredondo will be setting up "Camp Alex" at the base or near the Soldiers and Sailors Monument. We selected this site out of respect for the New London Peace Vigils held here by folks from St. Francis House. Special mention to New London's , Veteran for Peace member Cal Robertson, for his presence of conscience for over 20 years. Also VFP members will be assembling at the Memorial to VIGIL for PEACE. We invite folks to stop by and bring and light candles or meditate, stand, sit for and pray for peace ALL NIGHT at this site.